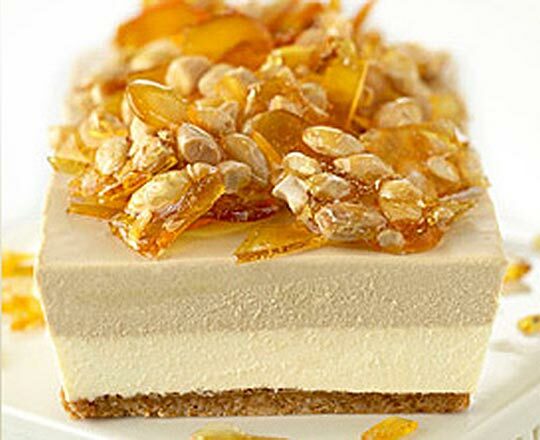 A tempting two layer mousse with a crunchy praline topping! Combine biscuit crumbs with butter and press into the base of cling wrap lined 21 x 11cm loaf pan. Chill. Beat Philly*, sugar and cream until smooth. Fold through whipped cream and gelatine mixture. Pour half the mixture over the prepared base. Add the coffee mixture to the remaining half and stir to combine. Gently pour over the vanilla mixture. Chill for several hours. Praline: Combine sugar and water in a heavy-based saucepan until dissolved. Boil, without stirring, until golden brown. Pour over almonds on a baking paper lined tray. When cool, break into shards and decorate cheesecake. Serve.